Architect Julius Taminiau borrowed principles from traditional Japanese tatami rooms to create a well-proportioned layout featuring space-saving built-in furniture at his floating home in Amsterdam. Taminiau was living with his girlfriend and two young children in a small flat in central Amsterdam before deciding to moving to the floating community near the Dutch city's old Olympic Stadium. 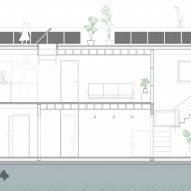 Having previously worked for Carl Turner Architects in London on an open-source floating house project, Taminiau serendipitously came across an affordable houseboat with its own moorings. The old boat was sold to make way for the new home, which the architect designed to meet the specific needs of his family. 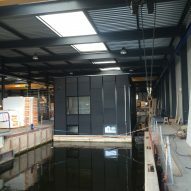 The houseboat was fabricated over 100 kilometres away in the town of Hardenberg, and sailed over the IJsselmeer to its new site. "I was looking for a place where we could build a family house with a relatively small budget," Taminiau told Dezeen. 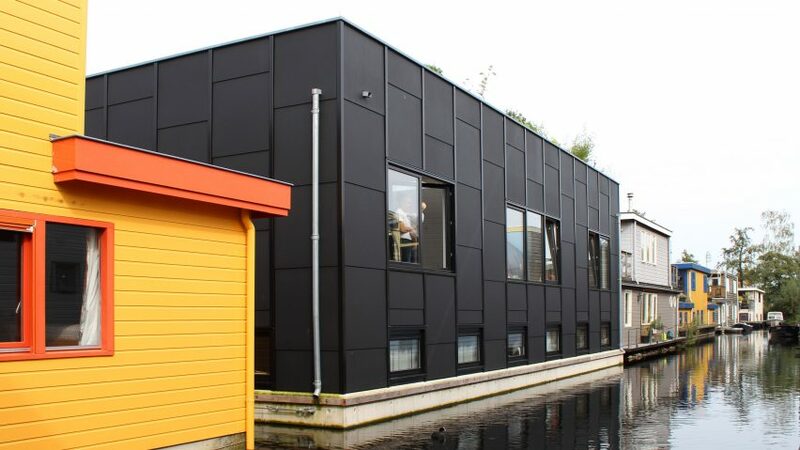 "This was very difficult as housing prices are increasing very abruptly in Amsterdam, so this houseboat was a perfect match." 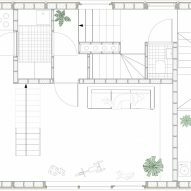 To achieve the desired volumes within a limited budget, the architect sought to rationalise the design as much as possible and introduced various space-saving features to create a practical and comfortable interior. As a guide to the internal proportions, Taminiau based the floorplan on traditional Japanese tatami mats, which have standardised dimensions and are typically used to create modular room layouts. "I'm very inspired by Japanese culture and architecture, and recently discovered that modernism was very much inspired by Japanese architecture, like the Katsura Imperial Villa," he explained. "Whenever seeing and experiencing these places you feel everything relates and therefore feels very harmonious and beautiful. I wanted to implement this in our house as well." 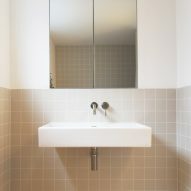 Tatami mats have similar proportions to standard plywood panels, which are used throughout the project. 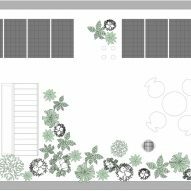 Following the tatami grid enabled entire panels to be used, which reduced waste and kept costs down. 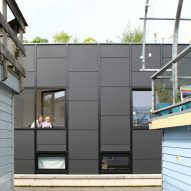 The external cladding also references tatami mats, as well as subtly evoking the arrangement of fish scales. The dark and glossy surfaces of the panels echo the tone and reflective quality of the water. The building features two levels, one of which is partly below the water line. The master bedroom with en-suite bathroom and two smaller bedrooms are located on the lower level, with the main living areas above. On one side of the entrance is a double-height space that Taminiau uses as his office during the week. At the weekends, the room can transform into a guest bedroom if needed. The interior layout is designed with minimal circulation so every space is used optimally. 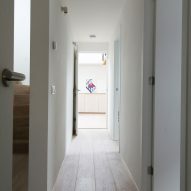 Storage and services are built into walls and spaces beneath the stairs, while additional seating is incorporated into a concrete kitchen island. An open staircase leading to a rooftop deck that is partly occupied by photovoltaic panels also serves to separate the living room from the kitchen and dining area. 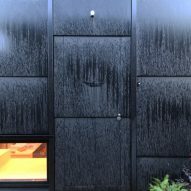 Taminiau said that the best thing about the houseboat is the feeling of the spaces being connected to the surrounding nature, which is enhanced by the use of exposed wood throughout the interior. The connection with nature is an inevitable outcome of the house's partial immersion in the water, which reflects dappled sunlight into the rooms and causes the boat to move very slightly in strong winds. The family can jump straight out of the windows into the water for a swim, and Taminiau has even caught fish from the house. Waterfowl including swans and ducks swim close to the windows of the rooms on the lower level. The architect said his favourite space is his office, which feels particularly spacious due to the double-height configuration and provides ample room for a suspended bridge leading to an elevated meeting area.